As of February 2019, we do not have a dyehouse that can produce the six rainbow (variegated, space-dyed) colorways. We will ship what we have on hand as it is ordered, but will not backorder any that are out-of-stock. We will continue to have the solids. This is a set of American-made yarns, dyed with fiber-reactive dyes to our own palette of coordinated colors. They are ideal for all forms of weaving, hand and machine knitting and crochet, and very reasonably priced. Forest 54 and Teal 55. There are two weights of smooth matt cotton, and five rayons: two smooth, a slub, a high-lustre twisted chenille and a bouclé. There are six rainbow colorways; the rest are solids. The Dragon Tales are all put up on 8-ounce cones. The cottons are soft and richly mellow, becoming more so over time. The rayon colors are especially saturated and lustrous; finished pieces enjoy an especially elegant drape. They are machine-washable and dryable, except for the chenille (wash once to finish, then dry-clean). SOLD BY THE CONE (Not by fractions of cone). If a cone is under-weight, we will pro-rate. All Dragon Tale Yarns are dyed with fiber-reactive dyes, but they are not always perfectly rinsed. With first wash, to avoid running, rinse well, and and move immediately to dryer. These yarns are also available undyed, in natural white, on one-pound cones. Choose from the list below to see prices, codes and colors for each of the eight types of Dragon Tale Yarns. Please remember that dye-lots vary; if an exact match matters, be sure to get enough the first time. The dye-lot number is marked inside each cone. ** Chenille is made from cross fibers secured in the twists of the plied core yarn, very much like a pipe cleaner. * Nylon binder, which takes dye a little bit more lightly than the rayon fiber. For item codes, add the 2-digit color number from the list below to the 4-digit yarn code in the list above. Priced per 8 ounce cone. 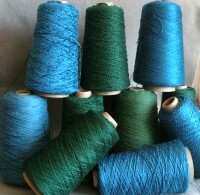 Any mix of types or colors qualifies for “6+” prices (They also mix in with our other yarns). Please note that the "6+" discounts are especially deep for these yarns. Follow this link to see all the DRAGON TALE COLORS & SOME SAMPLE PIECES.